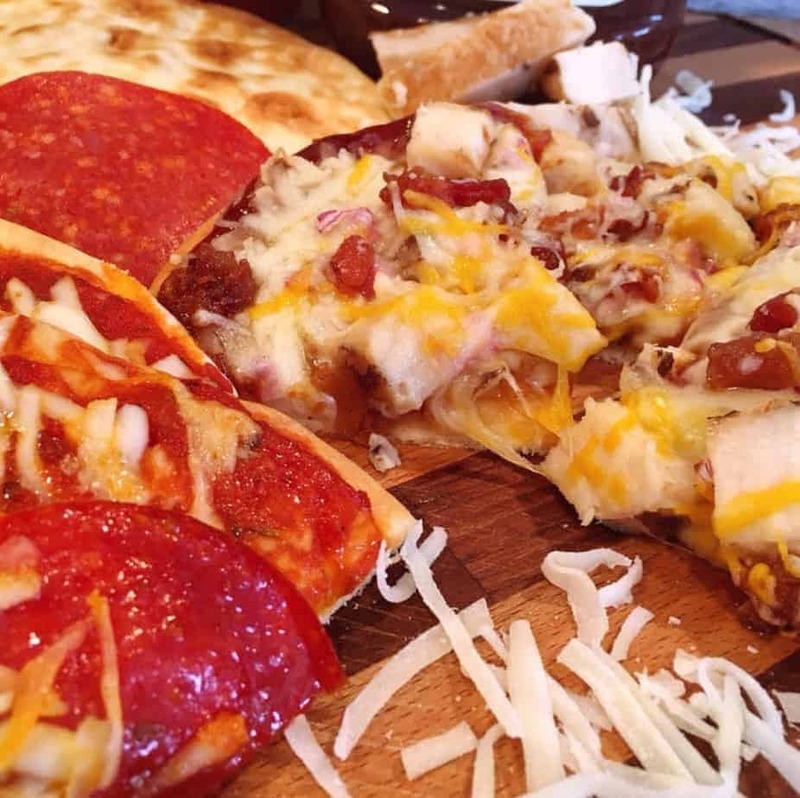 Flat Bread Personal Pan Pizza’s are a great way to have your favorite cheesy pizza in a matter of minutes! Greek Flat Bread is covered in your choice of sauce and toppings. The Bonus? 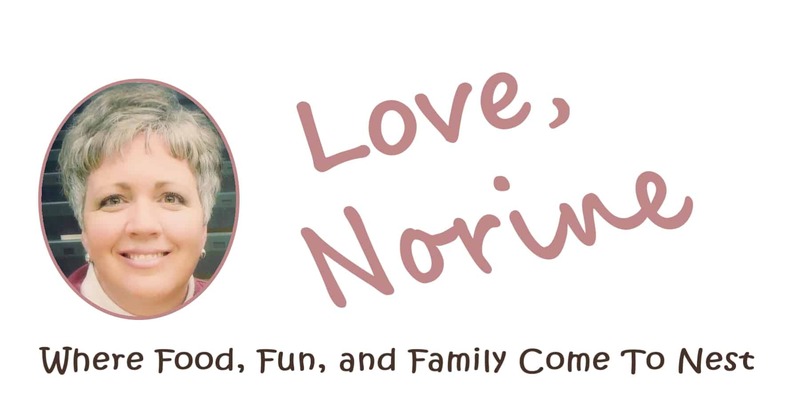 This recipe is toddler approved! That’s right! Last week I had my granddaughter over for a visit. She can be a pretty picky eater…I won’t say who she takes after… Ahemmmm…but I know she LOVES pizza! I happened to have a package of Greek Flat Bread sitting around and thought…”easy pizza crust”! (It’s scary how my mind works…truly scary!) 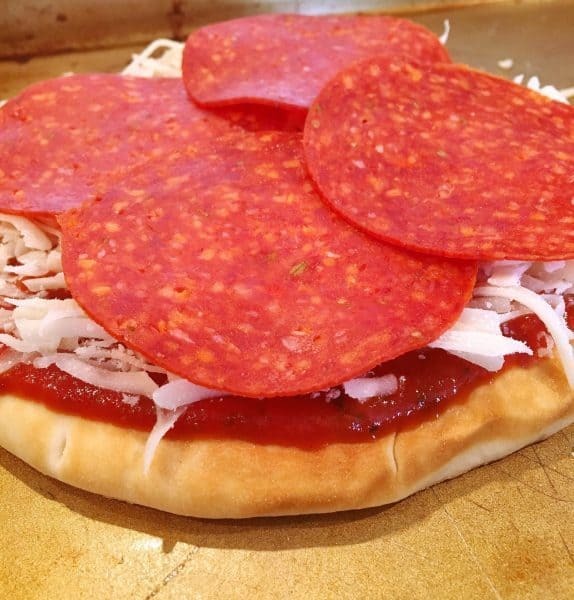 Before I knew it… I was constructing the perfect personal pepperoni pizza. How did my Lil’ “B” like it? She ATE the entire thing! Gobbled it up and wanted more! One think I love about this recipe…the size! I cut each pizza into 4 slices. Each slice is perfect for little hands. 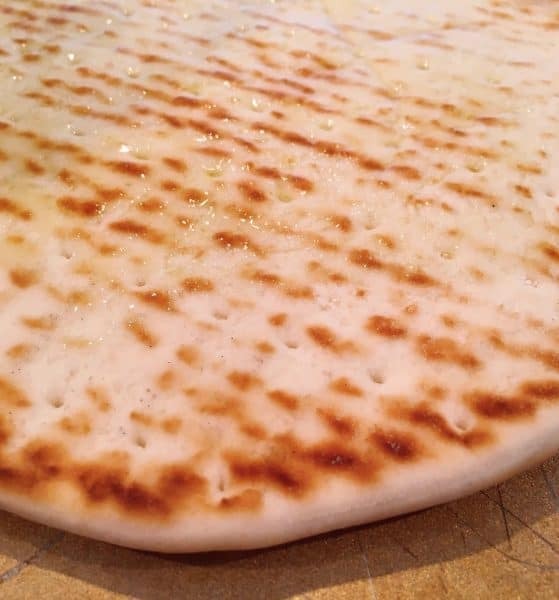 Start out brushing olive oil on the bottom of each Greek Flat Bread. This will give you a great crispy crust! 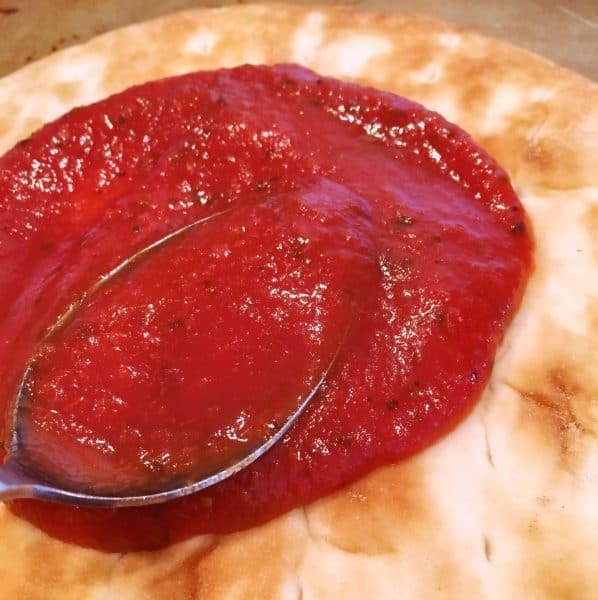 For a pepperoni pizza spread Pita with two heaping tablespoons of bottled spaghetti sauce. I like to use the Prego Traditional. You can use any sauce you prefer. 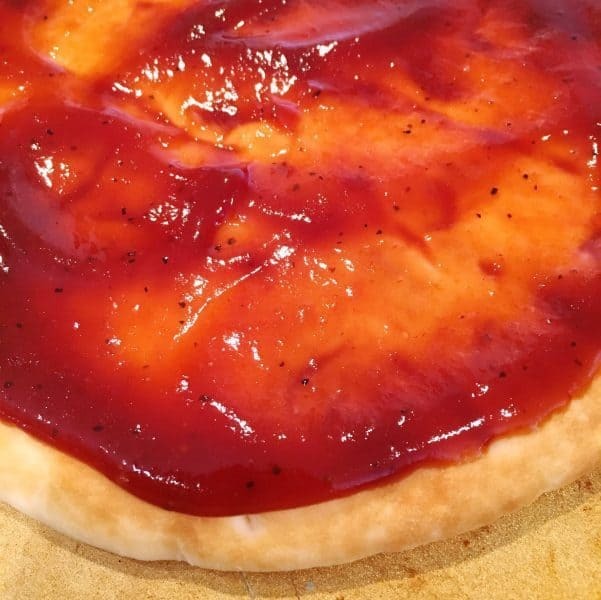 For My personal pizza I used Sweet Baby Ray’s BBQ Sauce because I wanted a BBQ Chicken Pizza. It was fabulous! Don’t be afraid to get creative. It’s one really fun aspect of this dish. Sprinkle with a handful of mozzarella cheese! Time for the toppings! I love to use the deli large pepperoni slices. Four large slices covers the entire top of this pizza. That way you get pepperoni in every bite! 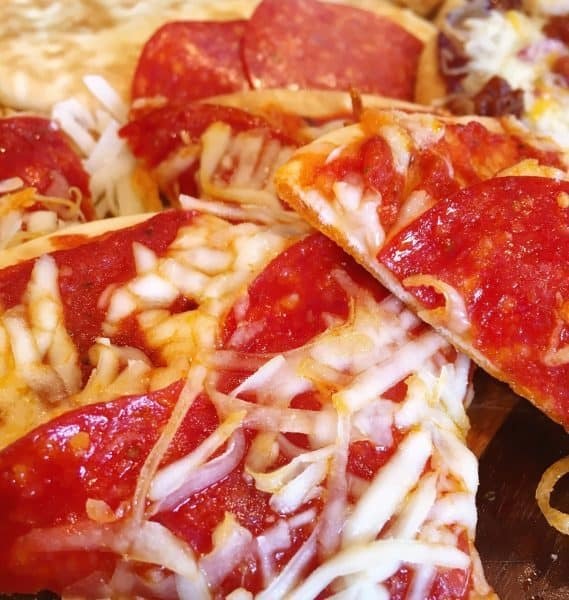 Who doesn’t want pepperoni in every bite? I know I do! Top with another sprinkle of cheese…cause CHEESE makes the world a better place! Can you have too much cheese? I think not! Let’s finish off the BBQ Chicken Pizza! Add pre-cooked packaged grilled chicken breast cut into cubes. Chopped Red Onion and a handful of bacon crumbles. The kind you find in the salad aisle! Be sure to get the “Real Bacon”…I’ll die of a heart attack if I hear you bought Bacon bits! 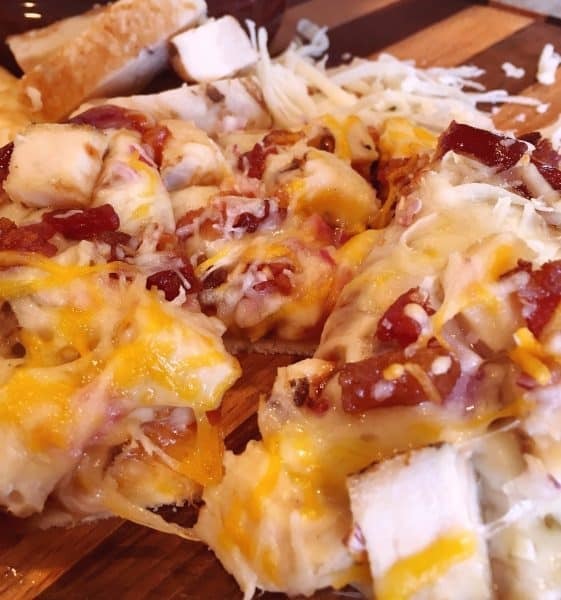 Finish the BBQ Chicken Pizza with a sprinkle of Cheddar and Jack cheese! Pop the pizza’s in a preheated 350° oven for 12-15 minutes. 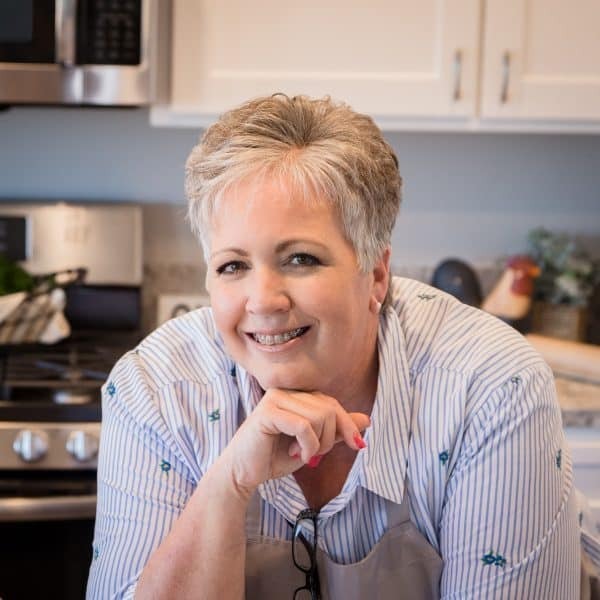 Bake times will differ depending on ovens and heating elements. The PERFECT pepperoni pizza! 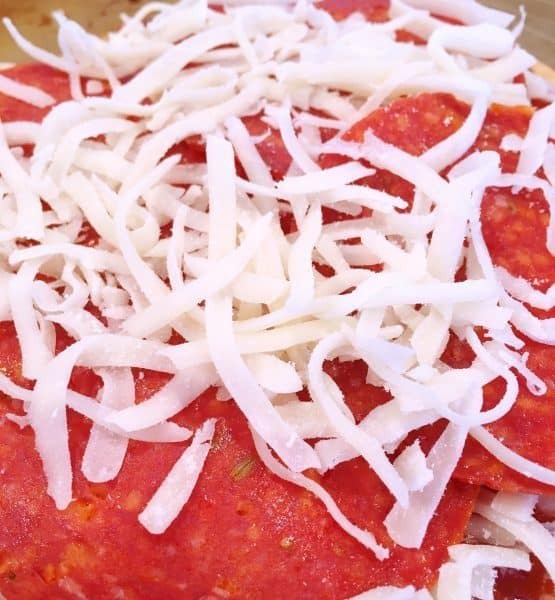 The crust is thin and crispy, the sauce blends perfectly with the cheese and pepperoni. These are so much better than the frozen pizza’s found at your grocery store. 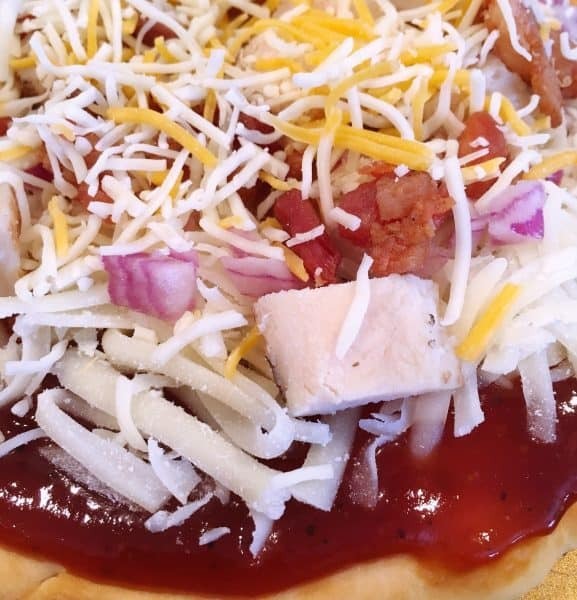 How did our BBQ Chicken Pizza turn out? I’ll let you be the judge. The toppings and sauce on this pizza were so AMAZING! As good as any BBQ Pizza I’ve had when dinning out. Not only is this a quick and easy lunch or dinner idea…it would be perfect for a grad party, kids birthday party, or a build your own pizza party! Just have all the toppings ready to go and you’ve got a fun, one of kind, party dinner idea! I even made a few extras, uncooked, placed them in large zip lock baggies and sent them home with my daughter so she could pop them in the oven during the week for her and Lil’ “B”. Which made me realize…this would be a great dinner idea for a neighbor who may need dinner brought in to her family! You could make the pizza’s up ahead of time, label them, place them in bags and drop them off to be cooked later. Limitless possibilities which is always a great recipe in my book! 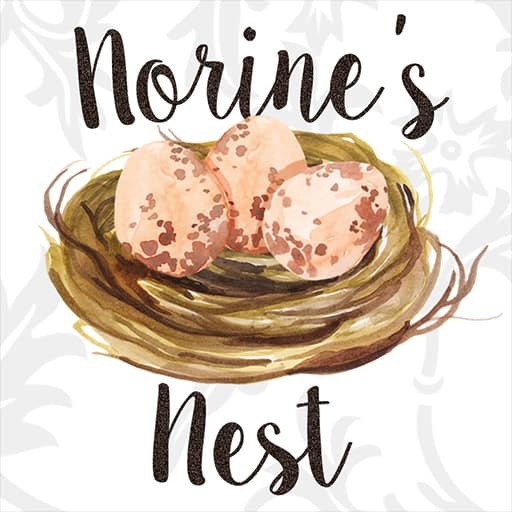 I know the kids at your Nest, big and small, will love this as much as we did! Enjoy! I’m sharing this recipe on Weekend Potluck and Meal Plan Monday. Click on the links to join the party! 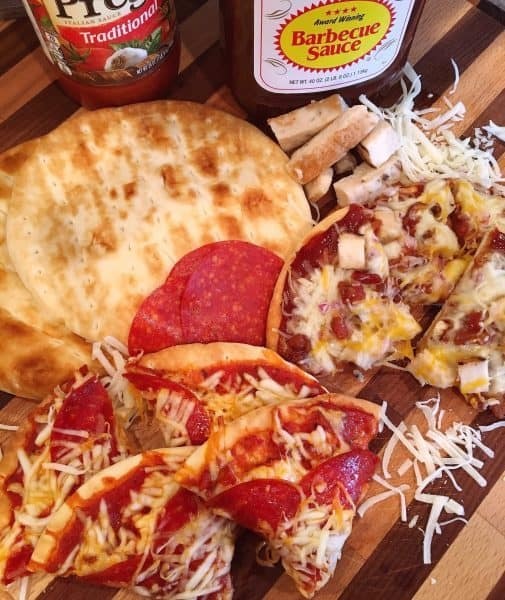 A Quick Easy Delicious Personal Pan Pita Pizza with all your favorite sauces and toppings. Great for parties, dinner, lunch, or even as a dinner for a neighbor in need. Kids LOVE them! Brush bottom of each pita with Olive Oil. Place bottom side down on a large baking sheet. Two pita's per baking sheet. Place two heaping Tablespoons of sauce per pita bread crust. Spread over top of pita leaving a 1/4 inch around the edge of each pizza. Cover sauce with a large handful of mozzarella cheese. Top with toppings, pepperoni, chicken, onion, or bacon. 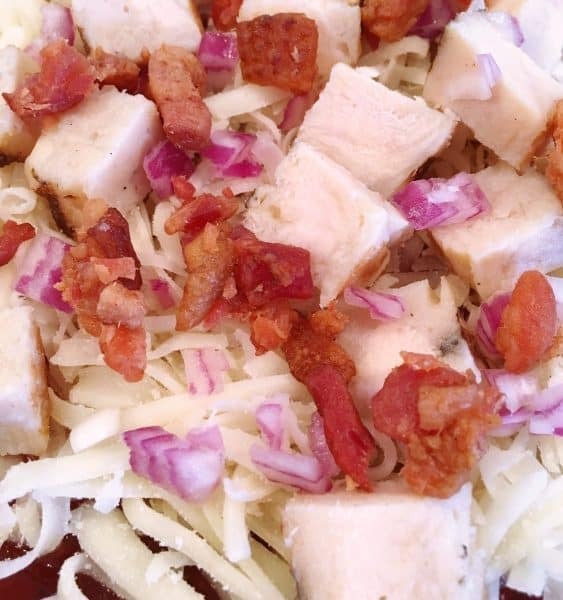 For the BBQ Chicken Pizza do 2 Tablespoons of BBQ Sauce, Cheese, Cubed Chicken, Red Onions and Bacon. Top BBQ Chicken Pizza with a small handful of Cheddar and Jack Cheese. Top Pepperoni Pizza with a small handful of Mozzarella Cheese. 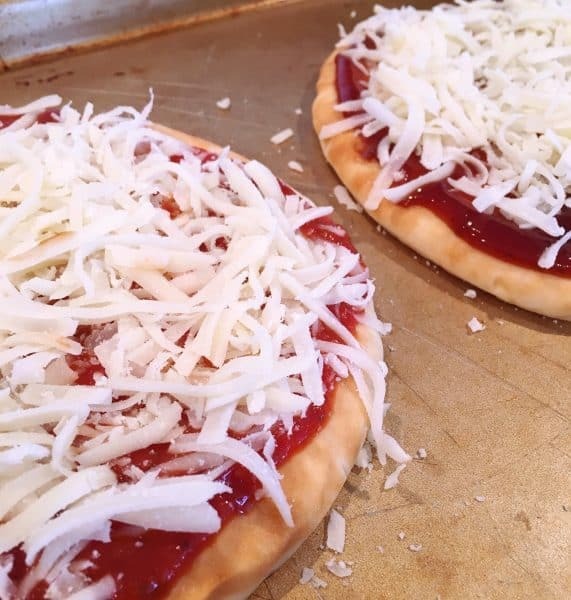 Pop in Oven for 12-15 minutes until cheese is bubbling and toppings are cooked. Remove from oven and slice each pizza into four small slices.